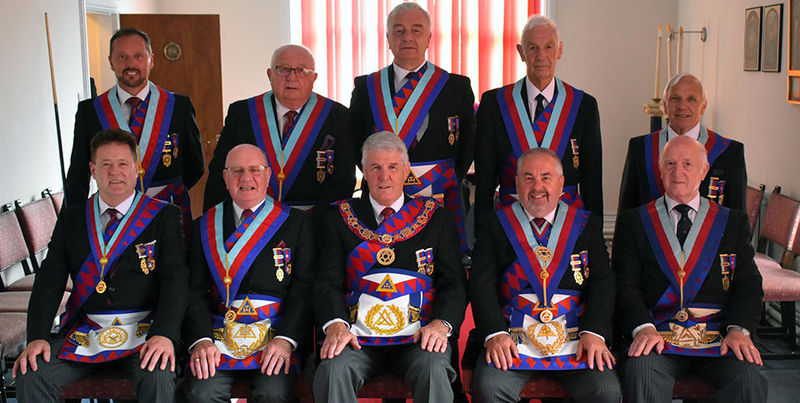 The installation meeting of Semper Sursum Chapter No 5622 at Barrow-in-Furness Masonic Hall proved a most congenial occasion and the 85 members and visitors present were treated to a delightful ceremony. Pictured from left to right waiting for proceedings to begin, are: Chris Butterfield, Paul Renton, Alan Hilton, Stuart Collins, Keith Jones, Nigel Fryer and Gary Rogerson. 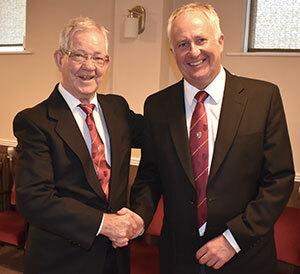 The principal guest was Deputy Grand Superintendent Paul Renton who was accompanied by local Assistant to the Provincial Grand Principals Chris Butterfield and Chris’s predecessor David Grainger. A further six grand officers were in attendance along with Furness and South Lakeland Group Chairman Peter Schofield and his deputy Gary Rogerson. Provincial Deputy Grand Director of Ceremonies Neil MacSymons oversaw their procession into the chapter along with the other eight acting Provincial grand officers who were present. The acting officers were David Barr PrGSN, Phil Preston PrGChStwd, Peter Quirk PrGSoj, Paul Thompson PrGStdB, John Roxburgh PrGStdB, Brian Griffiths PrGStwd, Dennis Laird PrGStwd and Steve McClintock PrGStwd. Outgoing first principal Stuart Collins set the tone as he installed Alan Hilton as his successor in a delightful manner. Alan ensconced Keith Jones as second principal in a similar fashion with Keith then demonstrating the same high standard in undertaking the work of inaugurating Nigel Fryer as third principal. The endeavours of the three installing principals were very well received by those watching on. Pictured left from left to right rear row, are: Brian Griffiths, Steve McClintock, Phil Preston, Neil MacSymons, Dennis Laird, Paul Thompson and John Roxburgh. Front row: Peter Quirk, David Grainger, Paul Renton, Chris Butterfield and David Barr. Pictured right from left to right, are: Mike Younger, Stuart Braithwaite, Steve Harris, David Shaw, Kevin Rigg and Dan Moyes. The officers appointed to the progressive offices were junior companions, which bodes well for the future of the chapter. Second principal Keith is the exception. Although he joined the chapter in 1986, work commitments meant he lived and worked away from the area for some years. During that time he was first principal of chapters in the metropolises of Birmingham and London but it is the first time he has occupied the second chair of his mother chapter. Scripture readings were rendered by junior companions in the persons of Stuart Braithwaite, David Shaw and Steve Harris. They had obviously spent time in preparation as the passages were well delivered and pleasurable to listen to. Jack Fawcett (left) congratulating son Dean on a job well done. The steady but firm hand of chapter director of ceremonies Dean Fawcett played a major part in ensuring the proceedings went so smoothly. He and his assistant Mike Jenkins later received praise for their efforts in making the ceremony so enjoyable. The unheralded efforts of scribe Ezra Alastair Davidson in ensuring that the occasion was such a success were also acknowledged. To mark the occasion, Alan presented Paul with two cheques; the first being in favour of the hall building fund for the sum of £200. The second was a donation of £300 to the Masonic Charitable Foundation 2021 Festival. This entitled Semper Sursum Chapter to style itself as a Vice Patron of the Festival and Paul presented the first principal with a certificate confirming this fact. Following the formalities, a meal was enjoyed in the Fairfield Suite of the hall. Given that the day was a very warm one it was welcoming that Alastair had had the foresight to order a cold meat salad as the main course. A raffle in the dining room raised a further £450 for the hall building fund. With the hall shortly to be closed to enable a new floor to be fitted in the dining room that donation will be well used. Pictured from left to right rear row, are: Neil MacSymons, John Quiggin, Barrie Crossley, Ralph Walker and Alan Jones. Front row: Peter Schofield, David Grainger, Paul Renton, Chris Butterfield and Rowly Saunders.